I hate photo-less posts! I tend to avoid making them. But there is not much to see. I cast on yesterday—Lion Brand Sock Ease, in the pink Cotton Candy colorway, for a toe up sock. 20 stitches to start, and a dozen rounds later, I had error, compounded on other errors.. and frogged the mess. Started again, and now have 40 stitches (a scant inch of toe)--not very much to show. Originally, my plan was for another pair of the Cross Purposes socks,(and to fully document this simple, but details matter pattern) in a different color way (a red plum (mullberry I think it is called). And then, well lots of ideas were competing to be next. But The Lion Brand Studio (here in NYC) is having a Socktacular on the 21st—with demo's, and contests, and prizes—including a raffle that requires a photo entry. So even if you aren't in NY, and can't make it to the studio, you can be part of the fun! Take a photograph of a pair of socks knit with Lion Brand Yarn (not specifically Sock Ease—so boot socks done with their sports weight superwash merino, or bed socks done in worsted would be eligible too) and you are entered to win. Well, I have 9 (yes, nine!) 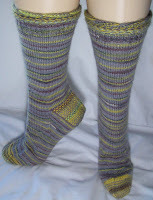 pairs of socks knit in Lion Brand yarn, 8 in the Magic Stripes, and a single pair in the new Sock Ease. Before the contest deadline, I hope to have 10 pairs. I still haven't decided on a stitch pattern—or for that matter, I haven't even looked! That's what I'll do tonight. I did take some photos this morning. I want to take all new photos of all my socks modeled on the new legs. I did laundry Monday evening (30 pairs of sock got washed!) Before they are folded and all put away, I want to slip them on the legs, and get new images..
Flat Vs on the legs (and the on the legs socks have been worn and wash a half dozen or so times! )They look so much better on the manikin legs!